My disclaimer here is that even though I did sleep some on the flight, I’m pretty burned out feeling. So if my sentences sometimes don’t make sense…that’s why. Upon arrival, I had to go through a passport check. It had a very German “papers please” feeling. Of course, maybe it seemed moreso because of my impending tours. The travel desk told me (can’t remember the proper name) that the only next flight to Warsaw isn’t until 18:05 – seven hours from my arrival at Helsinki Airport. American Airlines gave me a €15 (euro=around $20) voucher (to be used in one sitting) and an internet phone coin so I could call my mom who was waiting for me at the Warsaw airport. After walking back and forth in front of numerous gift shops, a cafe, and asking a number of people where this elusive internet phone was, I finally gave up and bought a sim card and little gsm cell phone. Only cost me around $70usd. So, I called my mom. militant. Perhaps I don’t spend enough time at airports, because I am still not used to seeing such militant security. I flew a lot when I was younger and there wasn’t such a militaristic presence. I suppose I shouldn’t be so surprised. It’s the world we live in now. This airport is chilly. I put a sweater on under my fleecy and I’m still cold. Of course, those of you who know me, know that I am easily chilled. At least I’m fed. The cafe only has pastries and coffee and I wanted real food. Something more substantial. I went upstairs to the restaurant and had a delicious salad. 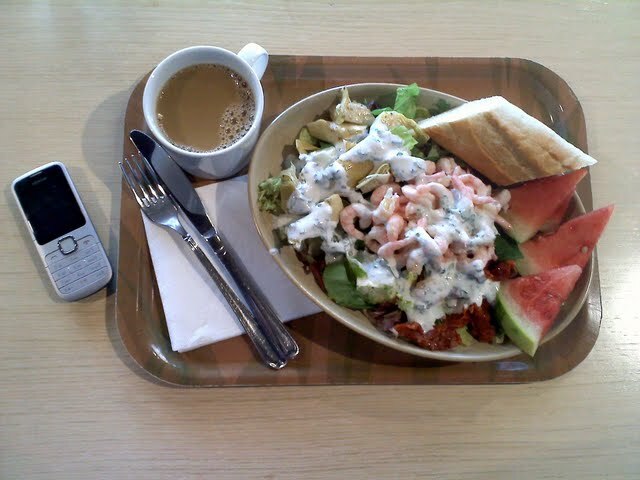 Since I had to use the voucher at one sitting, I got the pricey salad (15euro), a coffee and a bottled water. The salad was delicious. Shrimps, artichoke hearts, local fresh made cheese (I had one cube), watermelon slices, lettuce, sun-dried tomatoes, homemade yogurt with herb dressing, and baguette. I need more coffee. I wish they had little nappy-time cubbyholes like I’ve read they have in Japan. This is my first time in a place that isn’t predominantly English speaking. The airport loudspeaker first makes announcements in Finnish, then in English (albeit with a heavy accent). Most of the workers at the kiosks and little shops speak English, if not all that well. When I first tried to use my new phone to call my mom, I got a recording. I could make out when it suggested I press a number to do something, but it was all in Finnish. I went back to the shop from where I bought the phone and the nice man who had originally helped me took the phone and went through the recording settings and got it set up for me. Then I was finally able to call my mom. At least the airport has free wi-fi. There are little differences I keep noticing. The lifts are small – actually reminiscent of the elevator in my aunt’s old apartment building in Manhattan except instead of ancient and rickety, and noisy, these are modern, clean, and smooth. But about the same two-person capacity. I do like all the different accents and languages I overhear. Of course, I suppose you get that with most international terminals. If I cared more about fashion, I”d definitely start dressing more European. Of course, the women’s styles while good-looking, aren’t terribly motorcycle-funcational. Hey, a girl’s gotta have her priorities. There is good people watching from my cafe seat. I just wish I could warm up. I pulled out a sweater from my bag. Now I have a t-shirt, sweater and fleecy zip-up and I’m still cold. I was trying to get my VoIP Google Voice international work-around GrooVeIP to work but so far no good. Feh. Yay technology. I like the idea of shutting off and traveling quieter, but when things like a flight delay happen and I don’t have a way to contact my mom at the connecting end, I need to be plugged in. Ah, Madonna. “Holiday” is playing overhead. In Helsinki. Things are so different, are they? This entry was posted in masochism, musings, Poland, road trip, stuck in Helsinki, update by hoyden. Bookmark the permalink. Anything but those scones and muffins from Starbucks! I would probably live on croissants if I were traveling abroad since you can’t get a decent pastry in this country. (However I am in New York City for the next 3 hours.). Enough about the food…have you met any handsome strangers? I figured out my problem with the coffee – I should be ordering espresso! Today, that will happen. I quite enjoy croissant, but the buttery content sometimes is a little rough on my belly.